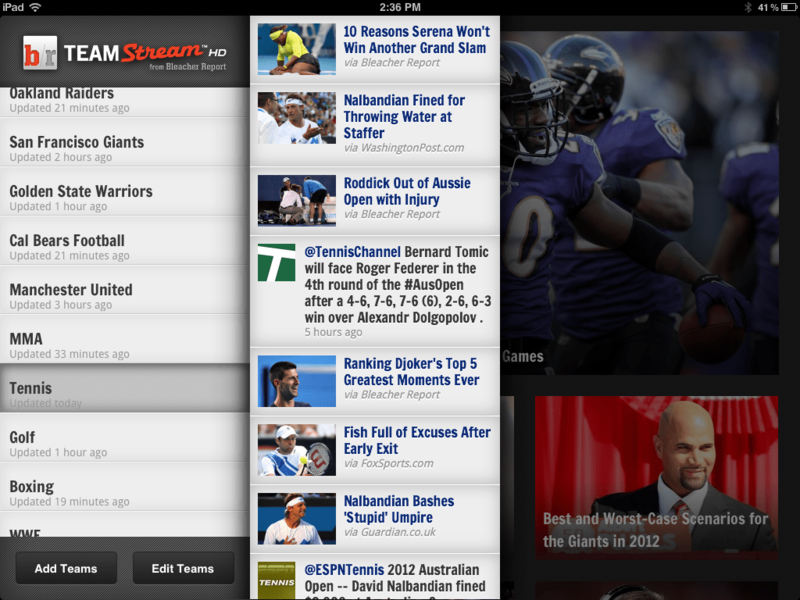 As with Team Stream on the iPhone, you can follow as many teams as you like. Choose from hundreds of professional and college teams, or even follow a whole sport, like tennis, golf, boxing, or NASCAR. Bleacher Report is unique in that they offer their own original reporting as well as pulling in the best stories from other sources, including tweets from teams and players. 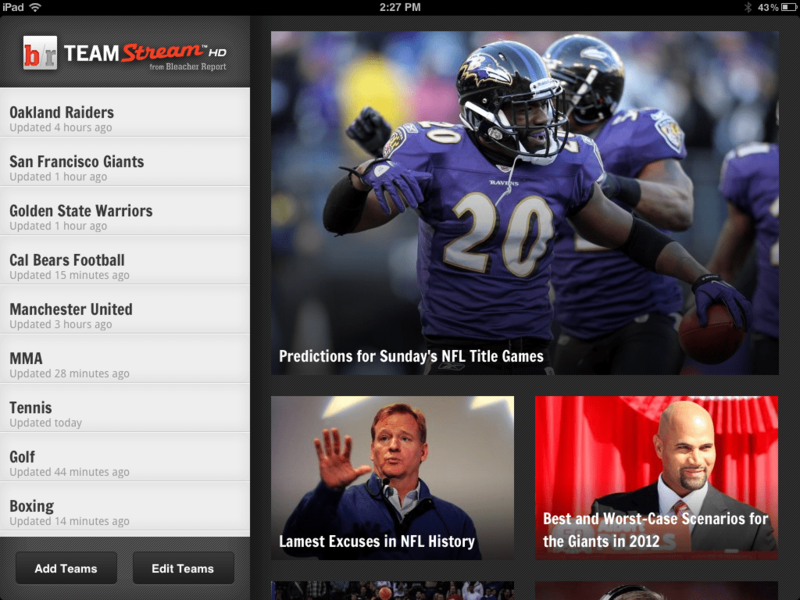 When we brought Team Stream to the iPad, we really wanted to take advantage of the screen space and provide an immersive experience. Articles fill the screen, minimizing the space used for navigation. The home screen presents a running grid of images from the top stories in the sports you’re interested in, and subtle transitions between screens make it a really pleasurable experience. One great feature of Team Stream is push notifications–B/R’s editorial staff tracks everything going on with your teams, and sends notifications when really important stories happen. They do a great job of filtering just the breaking news that fans will be interested in, and you can choose to only get notifications for your favorite teams, while you track everything that interests you in the app. After just a few weeks on the store, thousands of people are using Team Stream HD every day, and every app store review has given it 5 stars. News outlets have started to take note as well. 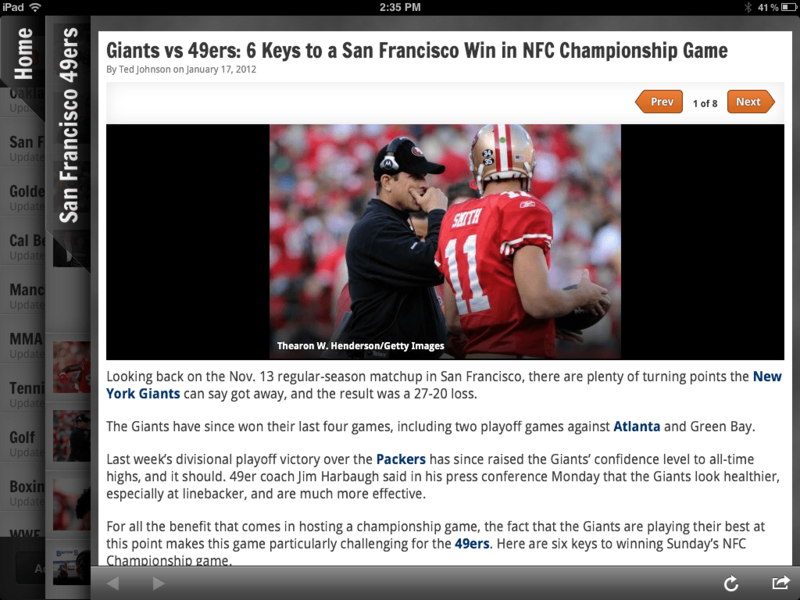 TechCrunch points out the app’s easy-to-use UI, while IntoMobile took note that we took the time to properly utilize the extra space on a tablet to enrich the experience, and Appolicious says It’s like having your sports teams’ news rooms right on your iPad. We’re so pleased to continue to work with Bleacher Report, and we can tell you that there’s a lot more in store. They’ve doubled down on mobile with a new mobile-optimized UI for articles, a spectacular new product manager, and a cadre of talented designers. Keep an eye out for great new features to come!